Click the Yellow Button below to enter your redemption code. ​Version 2.0. Requires iOS 6.1 or later. Compatible with iPhone®, iPad®, and iPod touch®. The AcuDesign App can be downloaded using a redemption code in the following countries: USA, Australia, Canada, Germany, New Zealand and the United Kingdom. 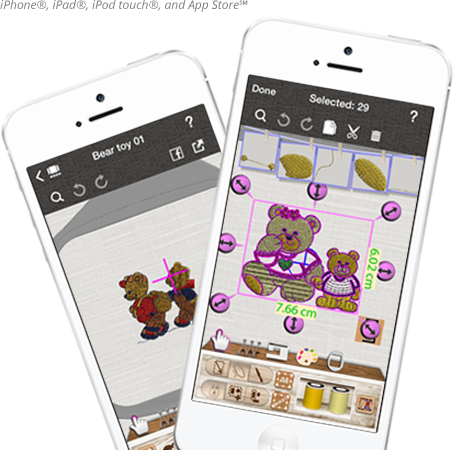 Additonal 250+ embroidery designs available for In-App purchase. 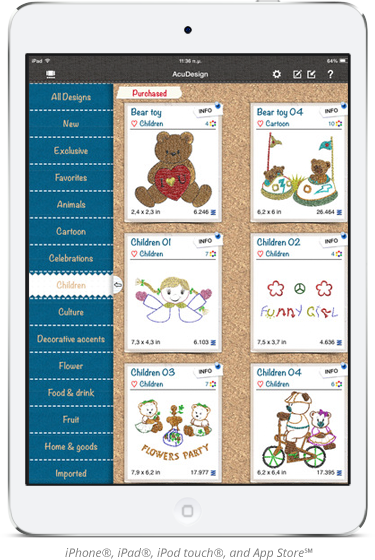 Import, export, print and edit your own collection of designs or purchased designs from your favorite Retailer or online, in all supported embroidery formats. 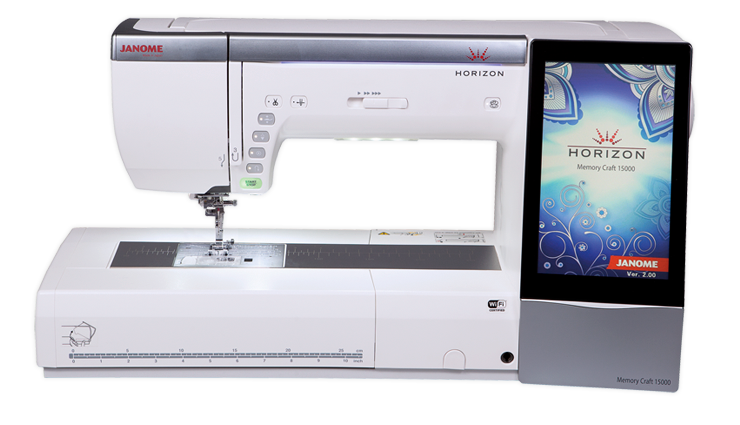 Scale your designs, change thread colors, fabric type and automatically adjust the density of embroidery designs. AcuDesign can save designs in multiple file formats to work with your machine. Preview designs in Photorealistic preview and stitching simulation to ensure perfection every time. Share your designs with your friends on Facebook with one click. Use your iOS device as a portable library, with automatic sync to iCloud and Dropbox! Photorealistic, real-time simulation of the stitching process, with machine speed adjustment option and “move frame” ability; the sound of the machine can be muted or its volume adjusted from the Preferences. Change fabric type and fabric color for better preview of the final embroidery result. Send the thread information that you will use in the specific design by email, add the quantity you need and use it as shopping list. I would like to receive other offers and news from Janome. Please only click "Submit" once. After a redemption code has been submitted you will receive an email with a link to download the AcuDesign App. If you do not receive this email check your Spam/Junk folder.